It may be nobody’s fault that the word “copywriting” has started to lose its meaning. In linguistics, we recognize this phenomenon as “semantic satiation” – you repeat a word so many times that it eventually starts disintegrating into an incomprehensible string of letters. As copywriting is everywhere around, it’s nothing peculiar that we’ve lost every idea of what it stands for. 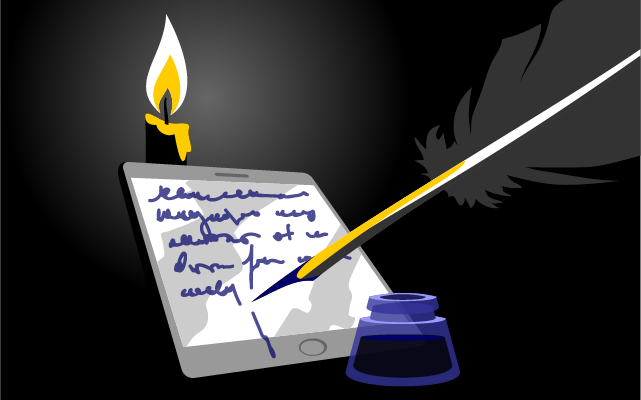 Is it a word for a digital scribbler? Does it involve a marketing professional? What about creative and content writing? Can it be that you are a copywriter too? Be that as it may, we invite you to join us for a quick game of definitions. Who knows, it may be that your true calling hides at the end of this article. The truth is, copywriting covers a range of jobs so vast that it’s not so surprising when even copywriters themselves cannot explain what they do for a living. Just ask one, and listen to them stutter. Best case scenario, you’ll receive the worst kind of logical fallacy – a circular definition. Such is the one offered by Dictionary.com, which incidentally doesn’t define copywriting at all. Instead, it offers another circular definition for a copywriter, established as “a writer of a copy”. Admittedly, the explanation becomes less faulty at the end, where it’s specified that a copywriter writes copies “especially for advertisements or publicity releases”. Perhaps mutual exclusivity is our only chance to get it right. So far, the best definition we’ve found is the one that compares copywriting to content writing, stipulating that the first prompts readers to take action, while the latter only informs. Now, that’s something we can work with. If the creation of relevant and valuable content is mutual to both copywriting and content writing, then their distinctiveness lies in their potential to engage. Copywriting can, therefore, be defined as the art of delivering words in a strategic, engaging, and actionable way. But, what exactly does it have to do with “advertisements and publicity releases”? It’s obvious that copywriting is some marketing, but which one? How important is it for this niche, and why? Whatever kind of digital scribbling you’re into, it’s time to find out where copywriting fits. First, let us say this: traditional advertising is struggling to survive. It’s still far from being dead, of course, but its click-through rates are dropping as we speak. Rather than falling for paid commercials, audiences now respond to organic marketing, inbound, and outbound alike. Notwithstanding that there’s a bit of copywriting in offline advertising as well, it’s safe to say that its primary focus is inbound marketing. In a vast number of cases, this includes blog posts, articles, and infographics, though copywriters do a whole lot of product descriptions, emails, and social media posts too. As such, copywriting stands at the beginning of every marketing campaign. As internet users rush to search engines for information about products they want to buy, copywriters encourage their shopping instincts with alluring themes and engaging wording. Consequently, everyone gets what they want. Readers get to enjoy the relevant information in a highly entertaining way, while brands get to rank better in Google, attract more customers, and most importantly, develop a voice that’s strong, trustworthy, and unique. A copywriter has to be a wordsmith, of course, but this is not where their job requirements end. There’s an unofficial rule that says that quality content asks for a process that’s half research and one-third editing, while the actual writing makes only around six percent of the overall project. Besides being skillful at researching, writing, and editing, copywriters need to master some aspects of project management as well, at least when it comes to planning and implementing marketing campaigns. That calls for a comprehensive skill set that is not so easy to find nor develop. The following are the four elements that a copywriter cannot do without. As mentioned a couple of times before, copywriting goes a bit beyond basic writing skills. It goes without saying that a copywriter’s grammar has to be immaculate. Still, a broad vocabulary, even lingo unique to certain niches, is needed as well. Finally, it is the copywriter’s unique style that makes all the difference. Only exceptionally successful copywriters get to choose their topics. As for the rest of us, versatility is another skill that’s crucial. Beginners write about pretty much everything and are expected to know how to find relevant and trustworthy resources for topics ranging from pet food to lead generation. It sounds a bit generic, but it’s nothing but. Take the pet food mentioned above, for instance, and remember that the first requirement for copywriting is the ability to engage. A copywriter’s job is to make anything sound exciting, regardless of how dull or technical it may be. Although SEO isn’t precisely a copywriter’s job, most of us have to flirt with it to succeed. Meanwhile, Neil Patel has a different understanding of how copywriting works: in his expert opinion, the keywords, headlines, and content itself should be tailored to suit the reader’s expectations and needs, not to cater to those of the employer brand. Reader-centricity brings us to the very beginning of the copywriting process – whatever it is that a copywriter needs to write about, their first concern should be how to make it tempting and satisfy the reader. That is the riddle that has to be solved over and over again, each step of the way. In general, researching for a copywriting project has three phases. First, a copywriter gathers information about the product or service at hand. Then, they consult a person involved with creation or selling. Finally, a copywriter puts themselves into a potential buyer’s shoes, determining what kind of content would tempt them to make a purchase. Specifically, what market and niche research come down to is the process of getting familiar with the reader’s expectations and needs. A copywriter has to adjust content to their level of awareness since both the depth of information and the tone of writing depend on it. Luckily, there are many popular copywriting and writing tools to help them succeed in the process. Then, a copywriter needs to understand the core motivation that lies at the root of the prospect’s decision tree. This motivation is crucial for tailoring a message that resonates with the audience. After all, a vast number of purchasing decisions is based on emotions – to engage, a copy has to be able to the thug at the reader’s heartstrings as well. Still, it’s only the best texts that possess the emotional component. Much more importantly, the content has to be relevant enough to provide all the information that a potential customer needs to know. In a word, a good copy has to offer clear benefits to the reader. Three copywriting principles contribute to how valuable and beneficial content is: AIDA, WAYS, and You vs. We. All three are equally valid, so we’ll briefly examine each of them. Being the ultimate formula for successful sales pitches, AIDA has quickly found its way into the copywriting kits. “A” stands for the reader’s “attention” that a copy has to attract, “I” for the “interest” they should show for the product after reading a copy, “D” for the “desire” to make a purchase, and “A” for the eventual “action” that converts a reader into a customer. What sounds like a silly name for a copywriting method is, in fact, a clever abbreviation for “Write as You Speak.” WAYS proposes simplicity of style and conversational language, thus being the best principle when it comes to concise, yet fact-dense copywriting. Remember reader-centricity? You vs. We focus on nothing but, making sure that the copy caters to the audience’s needs instead of pushing undisguised self-promotion. When research is done right, content creation is the easiest part of the process. It’s about putting all of the puzzle pieces into a coherent whole, which is a task that copywriters find incredibly rewarding. The only thing that’s needed is time and focus since everything else is already there. The best piece of advice is to put all of the information you have into a single, uninterrupted stream of words. Don’t stop to read what you’ve penned down, but keep writing (whether you’re writing a blog post, sales email or a book). At the end of this phase, a copywriter should have a raw version of the copy, the one that’s beneficial for the reader and elevated in style, though not necessarily polished in language and ready for publishing. Finally, we arrive at the last chapter of our copywriting handbook. At the same time, it is the last part of the creative process and the final piece of the puzzle. Editing should make a copy completely fool-proof, and it usually implies more than a simple grammar check. In the publishing industry, a copy editor is responsible for everything from syntax and sentence structure to accurate word choices and preferred style. The same applies to copywriting, which is why this part of the process requires more time and effort than writing itself. However well-written you may think the copy is, think again. Take the potential buyer’s perspective and read it as many times as you need, until it finally sounds informative and exciting enough to attract and retain. Beware of typos and minor issues, since modern-day readers have zero tolerance for mistakes. Now that you know what copywriting is and what copywriters do, we can only hope to see you in our midst shortly. Whatever your pace might be and however you choose to approach it, stay patient and committed. It’s only with trial and error that you can succeed, after all, so just keep writing.